Aulonocara bizarro (my naming)... an aberrant morph in a fish shop in Sacto. Cyphotilapia frontosa (Boulenger 1906), the Humphead Cichlid. East Central Africa; Lake Tanganyika endemic. To thirteen inches in length. Conditions in the wild: pH 8, dH 8-12, temp. 24-26 C. A beauty that is too often mis-placed with other fishes that are too docile and/or small for this bruiser. Can become a living terror with age/growth. Hemichromis bimaculatus Gill, 1872, the Jewel Cichlid. Wide spread in Africa. To a little over three inches in length. Rock dweller. 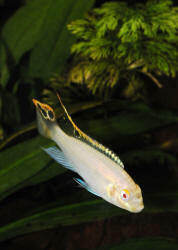 pH range: 6.5 - 7.5; dH range: 4 - 16, 20-24 C.
Julidochromis ornatus Boulenger 1898, the Golden Julie. East Central Africa; a Lake Tanganyika endemic. To a little over three inches in length. Rock dweller. pH range: 8-9, dH 9-18, temp. 20-24 C. Many different color, marking variations have occurred in this species with successive captive generations. Julidochromis marlieri Poll 1956. Africa; northwestern part of Lake Tanganyika. To five inches in length. Peaceful as far as Cichlids go. Hardy, undemanding species. Micro-feeders, not carnivores in the wild. pH 7-9, dH 8-14, temp. 22-25. Breeds in caves and crevices. 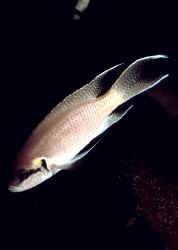 Julidochromis regani Poll 1942, the Convict Julie. East Central Africa; a Lake Tanganyika endemic. To a little over five inches in length. Lives openly over shallow sandy bottoms. pH range: 8.5-9.2, dH 8-14, temp. 22-25. A popular genus and species of easier going African Cichlids, that have become adapted to more "common" aquarium water quality conditions with successive captive generations. Genus Labeotropheus: Two valid species. 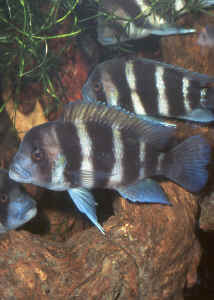 Labeotropheus fuelleborni Ahl 1926, the Blue Mbuna (other sport mutations exist with their own surnames). East Central Africa; Lake Malawi. A territorial species. Feeds on algae, worms, crustaceans, insects and plant matter in the wild. Cond.s: pH 7.5-8.5, dH to 12, temp. 22-25C. Here a mottled variety is shown in captivity. Neolamprologus multifasciatus (Boulenger 1906), the Multi-banded Tanganyikan Cichlid. Conds. : pH 7.3-8.5, dH to 18., temp. 24-26 C. Dist. East Central Africa: Endemic to Lake Tanganyika. One of the smallest cichlid species to about 4 cm. in length. A shell dweller that is peaceful amongst its own kind. Neolamprologus pulcher (Trewavas & Poll 1952), the Daffodil Cichlid. Conds. : pH 7.3-8.5, dH to 18., temp. 24-26 C. Dist. East Central Africa: Endemic to Lake Tanganyika. To about three inches in length. Paretroplus menarambo Allgayer 1996, a Madagascaran Cichlid. Conds. : pH 7.3-8.5, dH to 18., temp. 24-26 C. Dist. Africa: Madagascar. To about ten inches in length. Pelvicachromis pulcher (Boulenger 1901), the Rainbow Krib (from the old name, Kribensis, still sold in the pet-fish trade as). Originally from West Africa; southern Nigeria and Cameroon. A perennial favorite in the hobby, with many generations bred in captivity. Females larger (to four inches), better looking than males. Freshwater to brackish; pH 5-8, dH 5-19, temperature 24-25C. in the wild. Aquarium pic at right, albino variety below. Pelvicachromis taeniatus (Boulenger 1901), the Striped Kribensis. West Africa; lower Nigeria and Cameroon. To a little over three inches in length. Variable in color and markings. pH 6-8, dH 5-12, temp. 22-25 C. A hardy and relatively easygoing small Cichlid, bred in good numbers in captivity. Ps. sp. "black dorsal thundu" male from Thundu, Mozambique. Steatocranus casuarius Poll 1939, the Lionhead, Buffalohead Cichlid. From Central Africa; Stanley Pool, Congo Basin. To four inches in length, bottom dweller. Conditions in the wild: pH 6-8, dH 5-19, temp 24-28 C. One of the earliest "Africans" in the family in the trade/hobby. Widely bred, distributed since the 1960's.